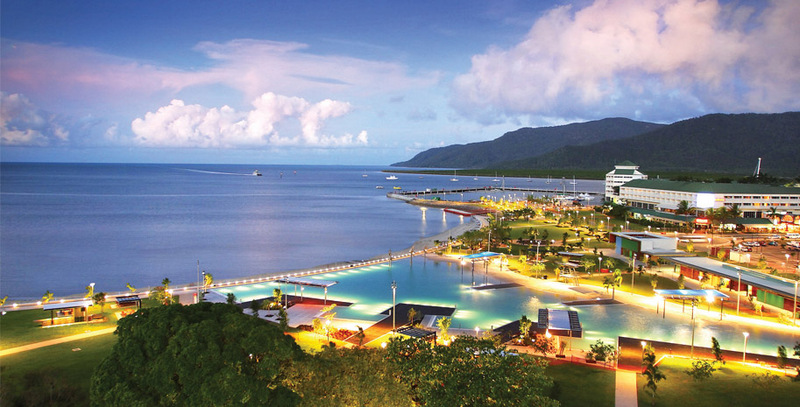 Cairns is a popular tourist city in the province Far North Queensland in Australia. For many tourists is the best place to start their travel around Queensland. The city is located on the east coast on a coastal strip and it is surrounded by rain forest. It is a major port for the export of goods. There are two rivers flow thing through the city’s boundary, the Mulgrave River and the Barron River. Cairns has a population of approximately 130 thousand people. Cairns has a lot of accommodations for all budgets and many drinking establishments and restaurant catering. The city has a handful of museums and an old wharf area. In the center a swimming lagoon is located with adjoining barbecue areas. Cairns is home to many sports, including basketball, amateur rugby and international cricket. The city is close to the sea, mountains and rain forest, so this gives you plenty of choices for activities, including swimming, fishing and walking. The area is popular for spotting a huge variety of birds, mammals, and reptiles. You can learn more about the Australian wildlife in wildlife exhibit Cairns Wildlife Dome. This exhibit has a replicated tropical rain forest. While Cairns itself does have much to offer, most travelers come to the place to visit sights nearby. In less than an hour you are at the Great Barrier Reef. Experiencing a tropical rain forest is possible in the Daintree National Park and the Cape Tribulation. There are tours to the Atherton Tabelands, Port Douglas and Copperlode Dam. Or you could enjoy exploring other places such as Cooktown and Cape York Peninsula. There are plenty of organized tours that depart from Cairns to different destinations. Travelers to Cairns are required a valid passport and visa. Citizens of America, Canada and Europe will automatically after application receive a tourist visa that is valid for 12 months. It permits multiple entries into Australia for a stay of up to 3 months on each visit. You’ll soon discover that Cairns is a popular place to hook up with fellow travelers.